Hello, I didn't find an exact category for this product so I post it here. My issue is Cineplayer BD 5.8.R9 version cannot play new Star Wars Blu-ray movies (9-disc saga edition), it simply hangs up when you try to play them. However, it can play blu-ray extra discs but not movies (episodes from I to VI). When you press Play button (Cineplayer), it reads discs a bit, but always a black screen is showed and if you want to close program you must kill it from task bar. My discs are in good state, it works in a BD player and in a PS3 (console). I don't have this issue with others BD movies using this program. I have the last update installed. Any ideas or someone with same issue? PS: I believe program needs an update, maybe it is a problem with old keys, DRM or that kind of stuff (protected copies). That Version number doesn't ring a bell??? Did you purchase it separately or if it was part of a Suite, which Suite??? As I said previously, I didn't find a category of this product on this community for posting it, sorry for that. PS: I had send a ticket (support) but I ask for if somebody has this same issue. When Avatar was released Roxio's Cineplayer wouldn't play it until they issued a update. That is by design in the BD format, they can update change encryption keys. Then others have to update their products and pay the toll $. They say there wasn't any profit left in DVD so they came up with this scheme. Isn't the BD format wonderful and expensive? It looks and sounds great for a ~ 30 years old movies and prequels even better. About the issue, it seems is not only a BD keys outdated, because with older version of Cineplayer BD (5.6) the program shows an image you must upgrade it, but with the newer (5.8) no images, only black screen. It's strange because only movie discs (BD) can't be played, but the extra (interviews, documentaries...) discs (BD) yes. And I think they have all same BD keys. So waiting for a software update, technical support can't solve it rigth now. I very much doubt there will be ANY update now. So right now, if I want to watch these movies I need to buy another software... what a mess! ... and that is why you must update any stand alone BR players. And probably why the new ones have internet connections (silent updates) for new disc protection. Yes it is a mess, please blame the correct people! 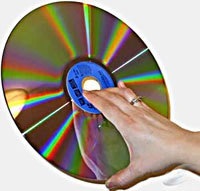 Several studios cited Blu-ray Disc's adoption of the BD+ anti-copying system as the reason they supported Blu-ray Disc over HD DVD. The copy protection scheme was to take "10 years" to crack, according to Richard Doherty, an analyst with Envisioneering Group. There is a new critical update (January 2012) for Cineplayer BD 5.8 which can play Star Wars BD movies right now. That is not the version that comes with Creator 2012 (where you posted). Where did you get 5.8 and how did you get the update? Is it this one? Yes, that version http://www.roxio.com/enu/company/3d/cineplayer.html but right now the web is a little mess to find it, I bought it some time ago, it's Cineplayer 3D with Blu-ray version playback, in url which you post they only say DVDs. You can get the update using the 'update option' when you launch the program. PS: Sorry for any inconvenience, I post it here in this category because there isn't an exact one for this product. I have Cineplayer 58 Suite 580b26i r09. 3D / Bluray. It does not play newer movies and no, it was not free. I paid for this application and expect it to function. It does not function the way it should. When did you buy it? Did you get your $$ worth? Everything has an expected lifetime. I know of another software player that needs to be "patched" whenever a new protection scheme comes out. That one is a lot more expensive. The blame falls on people who illegally rip copyright protected content and the companies who develop the nonsense protection schemes. Contact Roxio/Corel with the issue; perhaps they can help with a discount of one of the Corel blu ray player software.